ISR alumnus Ram Venkataraman Iyer has been promoted to associate professor with tenure in the Department of Mathematics and Statistics, Texas Tech University, Lubbock. 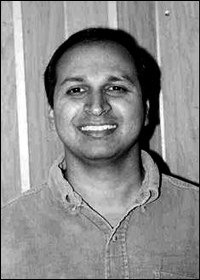 Iyer earned his Electrical Engineering Ph.D in 1999, advised by Professor P.S. Krishnaprasad (ECE/ISR). He then worked first as a postdoctoral researcher with Krishnaprasad until August 2000. From there Iyer worked at AFRL, Wright-Patterson AFB until August 2001. He joined Texas Tech in the fall of 2001 as an Assistant Professor. Iyer's research interests are in systems and control theory in the context of Aerospace and Smart Structures. In the aerospace context, he is interested in studying problems related to hypersonics and unmanned air vehicles (UAVs). In smart structures, he is interested in the modeling and control of actuators that are based on smart materials. In his earlier work, he showed that models for these actuators have a rate-independent component (that arises due to hysteresis losses) that is not found in the classical models studied in systems and control theory. He hopes to understand this new class of systems and develop systems and control theory for their use in aerospace and biomechanics applications. His work in approximate inverses for hysteresis operators has found applications in areas such as control of magnetostrictive and piezoelectric actuators. Recently, he has worked on system identification and control problems for rate-independent operators coupled with differential equations. He also is interested in the general theory of hysteresis operators. He also develops abort trajectory design fast algorithms for hypersonic vehicles that can be implemented online in real time. This problem is complicated by the speeds at which hypersonic vehicles travel; the range of attitude and altitude changes these vehicles go through and the actuator constraints due to failures. Mathematically, the problem is one of designing a path on the tangent bundle of the Lie Group SE(3) where initial and final positions, velocities, orientations and angular velocities are specified. In addition, he develops numerical methods for solving the first-order necessary conditions for optimal control, while using frame coordinates. Another set of problems he has studied in this area are the control allocation problems, wherein moments computed by a controller are assigned to various effectors, and the engine while respecting their bandwidths and rate, position limits. In unmanned air vehicles, he has worked on tour planning problems for a micro air vehicle and also on vision-based navigation. Recent work includes the development of the theory for a simple apposition eye type sensor for angular and linear velocity measurement. Such eyes are found in insects and crustaceans.